When I started to think about building CNC router it was very hard to find good drawings package. I have many years experience repairing and creating different electronic / mechanical devices. First version of this CNC router was assembled and checked. It works very well. 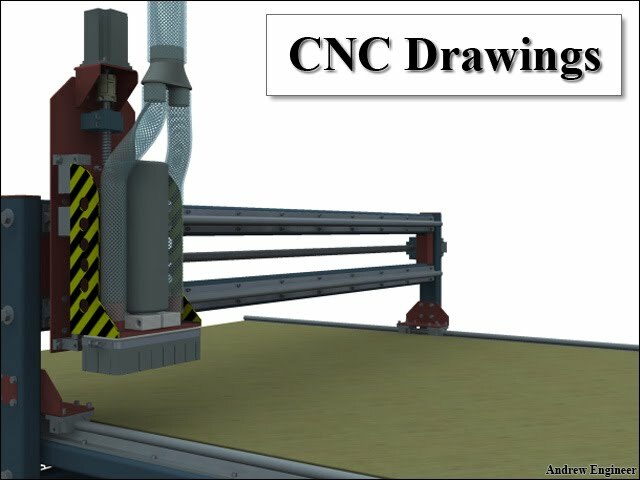 So I decided to make my own drawings package based on working CNC router model. These drawings help you to understand principles and basics how mechanical parts works together in CNC machine. The construction is reliable, simple and standard but not very easy to build because it contains many welded parts. All drawings are high quality (4096x3072px) images and can be printed on A4 or A3 paper. Weldments and parts – All parts that you need to make and/or weld. Purchased parts - All parts that you need to purchase. Assembly animation - Assembly sequence animation. Documentation – Documents and catalogues used. These drawings are only as an example of a machine assembly. You must have relevant experience of build. Or assemble the machine in the presence of a specialist. Drawings are supplied "as is" and may contain errors.